Looking for a bomber, 4-season, cold weather, go anywhere - do anything tent? You've found your match. 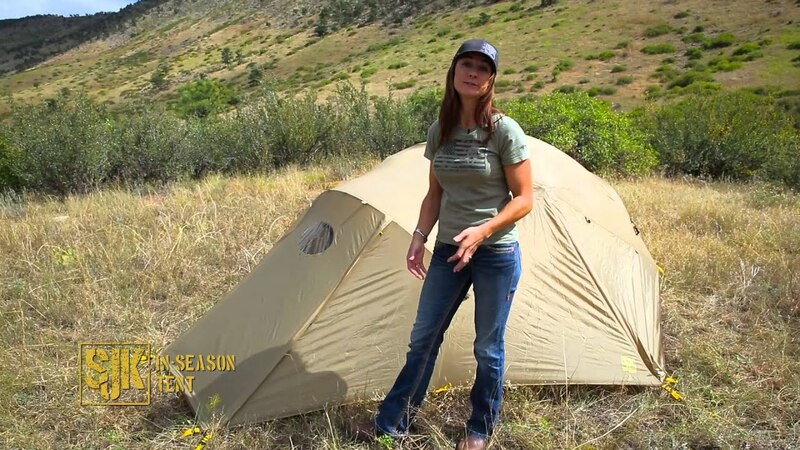 The In-Season 2 tent can do it all no matter the season. Burly three door, three vestibule design keeps the weather out, while providing huge storage and entryway options. Our five pole four-season structure promotes stability in the fiercest of storms while providing multiple ventilation options, allowing for optimal heat and condensation management. Ideal for late season hunts & cold weather adventures, the In-Season tent is rugged, dependable and downright comfortable. I was excited to buy this tent and take it to the mountains. I thought I would try it out in my front yard first. I had the tent up and was locking clip in place near rear section when I heard a ripping sound. There was a five inch tear on the seam where the floor meets the wall of the tent. Good news was the retailer gave me full store credit. I bought a different tent with a continuous fabric from floor to wall and think I will be happier. I have used tents for over 40 years and have never had anything like this happen before. I lived in this tent for 3 weeks in Alaska this year and stayed DRY through the rain and snow! We had a 12" snow fall one night and the tent held up to it! I was amazed. I like the 3 vestebules, they come in handy for packs, boots and gear. I was happy to see the heavy duty zippers. All around great tent for rugged use! I got this tent for me and my wife to use for 'hike in' camp sites. Its set up is a breeze and takes just a few minutes. While it is a little heavy for a back packing tent, splitting the load between me and my wife made its extremely easy to carry. It's was large enough to fit both of us and all our gear. In truth it was a bit more insulated than we had thought, with it being cold the first day we set it up we had the windows closed up. In the morning the walls were wet because the condensation had no where to go. After that we made sure at a minimum the top vent was open. The top vent is the only place where we had a problem at all. With it only being two pieces of mesh together a few bugs have been able to crawl through. The designers should have put a zip there instead. Its not much of a problem but a tick was one of the few bugs. The In-Season 2 tent is a heck of a tent. I bought it this season and have zero regrets! It is a 5 pole frame which makes it very sturdy in the West Texas high winds. I slept like a baby every night I took this thing out regardless of the weather outside. -The 3 doors and 3 vestibules make this tent extremely convenient to not bring your boots or rain soaked pack inside getting everything wet. -The main entrance has a large vestibule which can become a make shift porch when you unzip and prop up some trekking poles to it. -The multiple vents on bottom and top side of the fly help with the Texas heat. -Plenty of room for my wife, 2 large dogs, and myself comfortably. -It sets up quick and easily and breaks down just the same. Stop looking for another tent. For the price and quality, you won't find anything close to the In-Season 2. CHEERS GUYS! I did not use this in the extreme conditions it was really designed for just yet, but I broke it in this last summer. I was really impressed with it, and was very pleased I got it - my first tent. It even fit my cot ,since I was the only one using it, and with a bit of space left over. I have just one gripe, that being the vent at the top - when not in use it is only held closed by elastic which let quite a few ants inside the tent. I am going to put some sticky backed hook/loop to remedy this. That would be a good update if that ever happens. The multiple doors are a great feature and all the zippable flaps spread throughout made for good ventilation. I also like how it has an actual material covered ceiling - not just mesh, which is something I do not care for. It is quite easy to set up, however it did not have directions in the box or on site but someone e-mailed me one quickly so it was never a real issue. For the price I never found anything close when it comes to a 4 season tent - worth the money and worth the chance, you will not be disappointed. I used and abused this tent last year and it came out with flying colors. I had more rainy days / nights then clear ones last season but my gear was always dry. I am going on a drop caribou hunt in the middle of Alaska in a few weeks and every guy going has bought this tent to use after seeing how well it preformed for me last season. For a four season tent, the weight is right up there with other tents that cost almost twice as much. You can't go wrong with this tent. Had an opportunity to try this tent out for the first time on a winter trip. I was very impressed with the quality of the workmanship and materials that went into this tent. We were able to sleep two comfortably on 30" Exped Synmat 9LW with room to spare at our feet. With the 3 vestibules, we had plenty of storage outside of our sleeping area. Really loved the zippered doors that also could be zipped up/down from behind the mesh to create privacy/extra ventilation. The design and features of this product was quite impressive...I'm looking forward to using it in more harsh conditions, but with the extra reinforced pole structure, I'm confident that it will do very well. This is my first tent from Slumberjack, but I'm very impressed with this product.